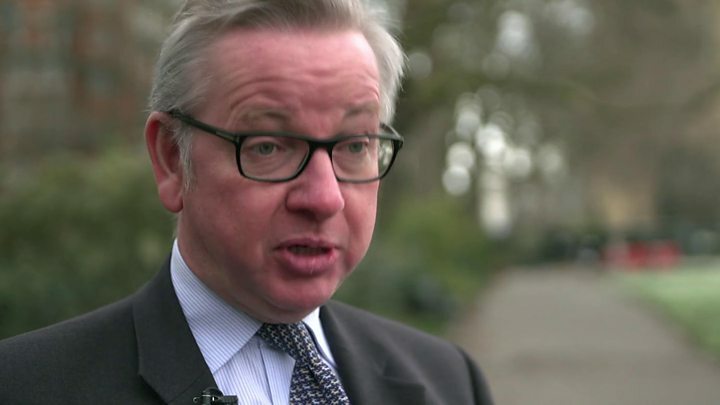 Environment Secretary Michael Gove has accused Sheffield City Council of "environmental vandalism" and promised to do "anything required" to end its controversial tree-felling programme. Thousands of trees, assessed as dead, dying, diseased, damaging or dangerous, have been cut down. Campaigners say healthy trees have also been lost. The Labour-run authority said it was "again disappointed" at Mr Gove's "unsubstantiated comments". The tree-felling is part of the £2bn 25-year Streets Ahead project and has seen about 5,500 trees cut down since 2012. Work is being done under a Private Finance Initiative (PFI) contract the council has with Amey. The authority will have penalties to pay if it terminates the deal and so far has refused to suspend or renegotiate it. Asked if the government would step in to help pay contract termination penalties, Mr Gove replied: "We will make sure that we will do anything that is required in order to stop this." He also said the council had been "strong-armed and draconian" with citizens who had tried to protest, and called on the Labour leadership to intervene. Campaigners have taken direct action to try to prevent trees being felled and numerous arrests have been made. Alleged offences range from assault and criminal damage to highway obstruction and trespass. In one instance a woman, aged in her 60s, was arrested for blowing a horn. Lord Scriven, Liberal Democrat peer and former council leader, has criticised the police's handling of protests. He complained that on some occasions more than 30 officers were present at the removal of just one tree. Former Liberal Democrat leader and ex-Sheffield MP Nick Clegg has described the felling as a "national scandal" and the several of the city's MPs have urged the council to call a halt. 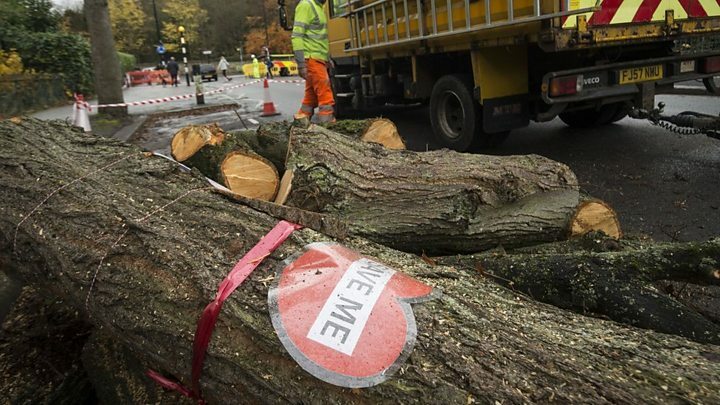 Image caption Michael Gove said the council's actions were "strong-armed and draconian"
Sheffield Tree Action Groups (STAG) has said residents are determined to continue their campaign against felling. "The city can't go on this way," it said. "[The council] has to admit that this PFI contract is a disaster and find a different way forward." Labour's Shadow Environment Secretary, Sue Hayman, has written to the council offering to formally mediate. She said: "Nobody wants to see much-loved, healthy trees felled. "Despite the fact that more trees will be planted by the end of the works than will be removed, I have urged Sheffield Council to exhaust all alternative options to felling the remaining trees and to fully acknowledge the environmental and community significance that these trees have. "Practical solutions and sensible dialogue are what is needed, not jumping on political bandwagons and throwing fuel on the fire, as we have seen from Michael Gove." Bryan Lodge, council cabinet member for the environment, said Conservatives had supported the contract and that the PFI model was used at central government's instruction. He said the council addressed Mr Gove's various claims in 2017 and repeated that it was doing "what the majority of Sheffield residents want". "Each and every tree which is removed is being replaced," Mr Lodge said. Meanwhile an Amey spokesperson said: "We believe Streets Ahead is a good contract but we appreciate that the street tree replacement work has caused concern and are committed to working with the Council for the duration of the contract. "We do not recognise reports that we have been unwilling to negotiate, however, any renegotiation would result in practical or financial changes." "There will be more street trees in Sheffield by the end of the programme. In the last three years, the council has planted over 65,000 trees in Sheffield, which is now home to around 4.5 million trees in total. "We are not simply replacing trees because we take any satisfaction in doing so, but to ensure that we future-proof our green credentials." Referring to the recent arrests of protesters, he said the council supported peaceful campaigning and protest but would not tolerate unlawful actions. Dr Alan Billings, the police and crime commissioner for South Yorkshire, has said the numbers protesting has increased significantly and the decision by the council to take out an injunction against protesters had "raised the temperature". He has commissioned an independent report to assess the policing of tree felling incidents.